Trojan Horsemen, a T-28 Warbird formation and aerobatic demonstration team located in Cincinnati, will perform formation passes during Military Appreciation Day on Saturday at Grimes Field. Pictured are two of the team’s T-28 Warbirds. The Army Aviation Heritage Foundation will be offering rides in its Huey, pictured, and Cobra helicopters during Saturday’s Military Appreciation Day at Grimes Field. The desire of two local men to honor those who served in the Vietnam War has resulted in Military Appreciation Day, a daylong event taking place Saturday, June 13 at Grimes Field. “The idea for the event came from Dave Millner and Jim Bob White, who together planned this for a year in order to honor the 50th anniversary of ground troops arriving in Vietnam, which is long past due for our Vietnam vets,” Grimes Field Manager Lou Driever said. Co-sponsored by DAV Chapter 31 and VFW Post 5451, Military Appreciation Day is being held in conjunction with the Champaign County Pilots Association’s annual Pancake Breakfast taking place Saturday from 7 to 11 a.m. in the Champaign Aviation Museum at the airport. Some of the helicopters scheduled to be on display include a blackhawk (Ohio Air National Guard), a Hughes 500E (Columbus Police Department), a Dolphin 365 medevac (CareFlight) and a Hiller. Fixed-wing aircrafts scheduled to be on display include a Helio Courier, three T-28’s, a King Air E90, a Stinson 10A, a Stearman, a Piper L21, a Fairchild F24, a C45 Expeditor, a C47 Dakota, a Beech 18, a L19 Bird Dog, a Nanchang CJ6A, an Aeronca L3 and two OV2 Skymasters. “We will also have the Ohio State Highway Patrol and the Civil Air Patrol (U.S. Air Force Auxiliary) showing off their aircraft,” Driever said. In addition to the aircraft on display, two Vietnam-era exhibits will be available for viewing – one provided by the Military Aviation Preservation Society out of North Canton and the other provided by the Air Heritage Museum out of Beaver Falls, Pennsylvania. “We will also have Honor Flight, the USO, Wounded Warrior Project, Vietnam Veterans of America and Vietnam Helicopter Pilots Association in the house,” Driever said. To gain entrance into Grimes Field on Saturday for the Military Appreciation Day event, organizers are charging $1 per person with veterans admitted free of charge. “Admission is only $1 because we want to provide parents and grandparents the opportunity to bring their kids or grandkids out to the airport for what promises to be a great time,” Driever said, adding proceeds will go toward covering the costs of the event and to start a fund for the purpose of erecting a Vietnam War memorial in Urbana. Along with the rows of aircraft to be on display, Driver said, there will also be various events and activities taking place throughout the day, including the opportunity for eventgoers to take to the sky. The Army Aviation Heritage Foundation (AAHF), a nonprofit organization based out of Georgia, will be providing guests the chance to ride in two different military helicopters – a Huey and a Cobra. 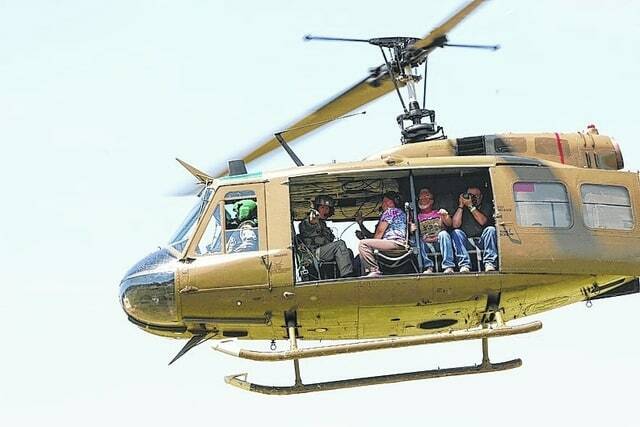 A ride in the Huey will cost $75 per person, and each flight can fit up to 10 people at a time. Kids must be at least 5 years of age to ride and must be accompanied by a parent or guardian. Individuals interested in flying in the Cobra must be at least 16 years of age. The cost is $300 for an 8-minute ride and $500 for a 12- to 14-minute ride. At 2 p.m., the Trojan Horseman, a six-ship T-28 Warbird formation and aerobatic demonstration team based out of Cincinnati, will provide a mini-air show of sorts. The final scheduled event of the day is a tribute to the 10 Champaign County natives who lost their lives in the Vietnam War. The ceremony, which will feature a color guard, will take place at the flag pole beginning at 5 p.m.
Driever said in between the scheduled events, guests can stop by the beer garden where Vietnam-era music will be played, visit with recruiters from all five branches of the U.S. Armed Forces, or check out a hovercraft built by Ohio Hi-Point Career Center students. Also throughout the day, a shuttle service will be operating between Grimes Field and the Champaign County Fairgrounds, site of the inaugural Rhythm and Foods Festival taking place Friday and Saturday. Driever said the shuttle, which is being provided free of charge compliments of Military Appreciation Day sponsors and CRSI, will also be stopping in the downtown area for those interested in visiting local merchants.